An Infrared sauna can be a powerful tool in the battle to overcome illness or in simply improving your overall health. These powerful detoxification devices are similar to conventional saunas that you may see at the gym but differ in how they expose your body to heat. Infrared light is absorbed by your body and works to heat from the inside out—as opposed to traditional saunas that work through an outside-in approach. Infrared saunas offer themselves as unique tools in helping to maintain a healthy natural balance. Infrared saunas often sold as units that easily fit into your house, help the body by eliminate harmful toxins and help many different circulatory and metabolic functions . They are known to have no health risk at all for people of any age, be much more efficient and natural than traditional Scandinavian saunas. Some sauna products are clearly better than others—although the best infrared sauna for you can only be determined by your own needs and uses. As found by clinical research, infrared saunas may be able to provide potent health benefits for detoxification, improving circulation, assisting healthy weight Loss, lowering blood pressure, and even in preventing common colds! Infrared saunas utilize the same types of energy that the sun bathes us in, although only a specific part. Regular saunas heat up the body by first heating the air, which is then transferred to your body. Infrared Saunas use powerful heat elements to send out infrared energy, which is easily absorbed by your body. While both methods accomplish the same end goal, infrared saunas are able to do so much more efficiently, and with a less amount of heat. This means that your body will heat up faster, achieving the same powerful benefits found from traditional sauna therapy— quicker and more efficiently! The efficiency in heating and lack of cumbersome components like heat rocks and large electric/coal heaters make a home infrared sauna preferable over any other option. Infrared light is produced by the Sun, and nearly all living things you will come into contact with require it to live a healthy life (some of those deep sea monsters might not.) Infrared light is a smaller section of what is referred to by science as the Electromagnetic Spectrum. This is a type of map for all forms of energy in the universe. The most familiar section of this spectrum is the visible light portion, which describes all the light that you can see with your eyes. Below that section are things like radio waves, and above it—Xrays and gamma rays. Energy above the visible spectrum is typically seen as dangerous, and below is usually considered to be harmless. 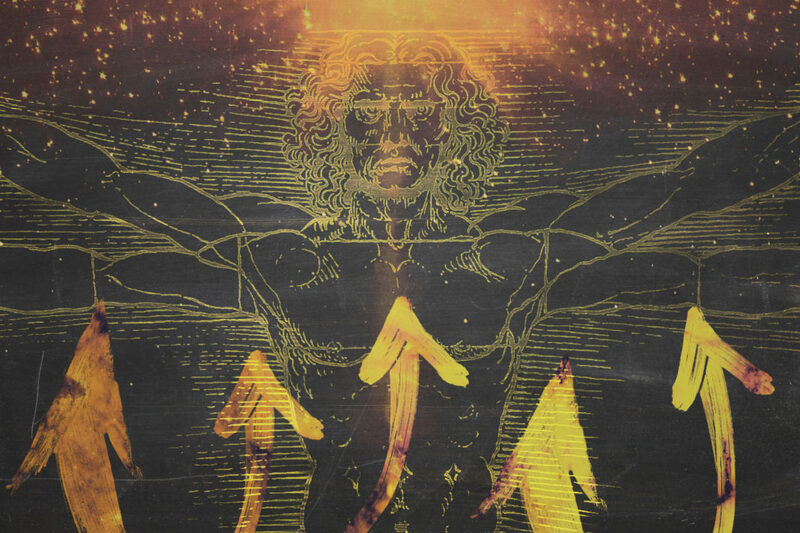 Visible light, and energy just above and below; has the capacity to greatly benefit your body. Simply put, infrared saunas are powerful ways to energize you body on a cellular level. They don’t use cumbersome and dangerous heating elements; which make them a great choice for home use. Infrared light is found on this scale at the very bottom of what the human eye can see, in the red section, and also just below it. Infrared light is comprised of three smaller sections in itself; far, mid, and near-infrared light. Near-infrared light is that warming red light that heating lamps use, and far infrared is just below what your eyes can see. Each of these different ‘sections’ of infrared light has demonstrated very valuable ability to help cleanse and heal your body. 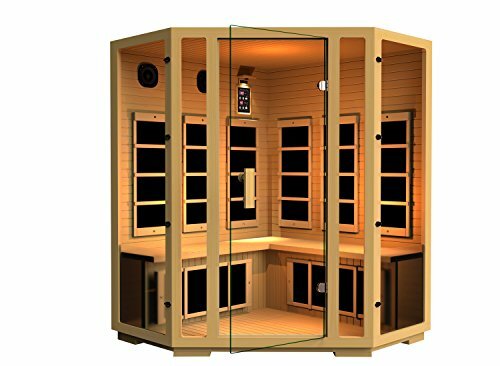 The best infrared saunas on the market make use of the entire spectrum of infrared light, and will often contain LEDs in addition to carbon-fiber heating elements. Simply put, infrared saunas are powerful ways to energize your body on a cellular level. They don’t use cumbersome and dangerous heating elements; which make them a great choice for home use. Modern technology has found ways to harness nanotechnology to produce carbon-fiber heating elements which emit the healing and beneficial spectrum of infrared light—and do so while consuming little energy. This powerful technology means that infrared saunas can provide a full-power experience simply by being plugged into a common household outlet! Research has shown that regular use of an infrared sauna can help your body get rid of deep tissue toxins, greatly improve circulation, lose weight, and many other powerful actions. Infrared light, in general, can be considered what the sun gracefully bombards us with all day, every day. This warming, healing, energizing light has the capacity to help us thrive. Imagine life without the sun; you wouldn’t exist! The infrared sauna benefits experienced by your body are nothing short of miraculous, and below you’ll find an in-depth look at some of the more notable benefits, as well as several infrared sauna reviews for those that are considering purchasing one for their homes. Detoxification is a great way to help your body recover from chronic health issues such as autoimmune and toxin-induced conditions. This happens when your body begins to open it’s skin pores and sweat out fluids. This type of infrared detoxification is much more effective because the body is heated up from the inside—out, as opposed to the outside—in with traditional Scandinavian-style saunas . This means that toxins built up in deep tissues and organs are able to begin their release, often helping to relieve long-suffered chronic health issues. Many systems of the body such as the Lymphatic system, can be extremely difficult to successfully detoxify. An infrared sauna can greatly increase the effectiveness of such a lymphatic cleanse, as well as many others. Saunas help improve circulation by heating up your body’s fluids so they are able to more easily move around. While certainly, no replacement for daily exercise, routine time spent in saunas can help promote many of the same circulatory benefits found in daily running or walks. For those caught in the modern rat race, it can often be hard to find time every day to go to the gym or running. One strong selling point of home infrared saunas for many is that you don’t have to worry about your children or animals like you would in going to the gym—you’re still right there at home! Infrared light has the ability to cause a large production of nitric oxide on a cellular level in your body. This compound relaxes your vascular system and provides a great amount of oxygen in your bloodstream . Infrared saunas can help promote healthy weight loss by giving your body a metabolic kick-start similar to what can be experienced through rigorous exercise. In one study researchers found that body weight dropped by almost an entire kilogram after 1 hour in the sauna ! In addition to the direct weight loss through fluids and the boosting of metabolic processes, your body will likely begin to lose weight naturally as a by-product of the release of long-held toxins—simply because it is able to function more naturally! This type of energy exposure sends many of the same signals to your body that exercise does—which causes a boost in overall metabolism. This type of body ‘hack’ can be greatly beneficial if you have a tight schedule to limit the amount of daily exercise you can squeeze in. Sauna bathing shows typically causes about a 20% increase in heart rate, which is an indicator that overall vascular resistance has lowered . Regular usage of saunas would conceivably help promote a long-term reduction in blood-pressure, bringing along all the related benefits of lowered numbers. Research has been spotty over the years regarding the safety of saunas for use by patients with cardiovascular conditions, but modern conclusions state that many cardiologists have concluded such exposure to short-term heat poses no threat whatsoever . This research is strongly related to that in which shows the powerful benefit of nitric oxide production that can be spawned by infrared light therapy. In fact, Nitroglycerin use to be used as one of the primary treatments for people with heart conditions. Its efficacy was found through the human body’s conversion of it to Nitric Oxide! It’s no surprise, with all the other amazing health benefits of infrared saunas, they are also able to help fight off common colds. In fact, one study found that regular sauna use can eliminate the likelihood of getting sick by 50% ! While saunas seem much more enticing in the winter months as a great way to boost your core temperature back to a comfortable level, it may also help fight off those nasty winter bugs like the flu! It’s little surprise that something that offers so many specific health benefits can offer such a holistic healing effect. Infrared light therapy is a lot like rejuvenation to your entire body—starting at the cellular level and working it’s way out! Most saunas found in local gyms or health clubs are those of traditional Scandinavian style—consisting of coals on top of an electric heater, with some water to add occasional steam to the room. Finding a business that offers access to these powerful infrared saunas can be quite difficult, usually impossible for those not living in larger cities. With the growing awareness of the powerful health benefits of infrared saunas, many companies have started making infrared saunas for home installation. While the thought of ordering a sauna online may seem a bit odd at first—it’s become quite commonplace these days! For prices ranging from $200 for simple ‘portable’ infrared saunas to well over $15,000 for luxury models, there is an infrared sauna for nearly every preference and price range. Another bonus—Most come with FREE Shipping! Broadly speaking, there are two different types of consumer infrared saunas: portable saunas and permanent saunas. While technically both types are, in fact, portable—one is much more so. This type of infrared sauna represents the vast majority of products available on the market. While these models aren’t considered portable, they also aren’t permanent additions to your home in the way that hiring a contractor to build a sauna in your home would be. These non-portable saunas are simply larger designs that involve some careful planning and muscle to move around very often. These models typically feature anywhere from 4 to a dozen or more carbon EMF emitting heaters, can seat multiple people at once, are made from toxin-free natural woods, and even come with such amenities as built-in MP3 players! Generally, these types of saunas are custom-built by contractors or architects and simply integrate certain EMF components to provide the benefits of infrared saunas. If you’re looking to add a permanent solution to your home, it’s recommended that you put out some feelers among local designers and contractors. For everyone else; below you’ll find very portable models and other semi-portable options. These saunas are quite odd to view at first, resembling some sort of odd Halloween costume in which your body has transformed into a legless robot. However, these products provide the same benefit of infrared exposure to help get all the health benefits of larger infrared sauna usage. 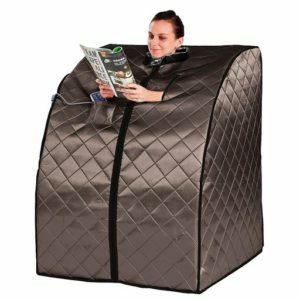 Take, for example, the Rejuvenator from Radiant Saunas—which is basically a zip-up enclosure that fits around a chair you sit in during use. This product uses 3 carbon fiber EMF-emitting heating pads, has a maximum heat range of up to 150 degrees and retails for less than $200. This type of product should be seen a concession if you are hoping to get the full benefits of an infrared sauna, but not at all a bad choice for those looking to save money and just warm-up to the idea of having an in-home sauna. 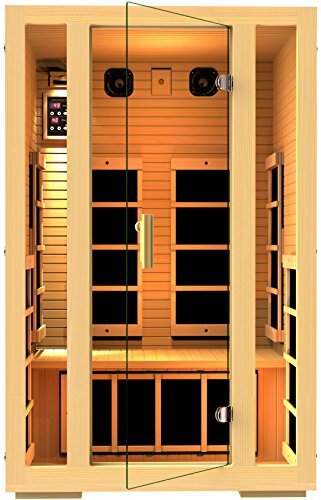 These are the saunas that are priced at under $1000 dollars, cover all the essentials functions, but lack a lot of the bells and whistles. The low end of this category is usually around $899, but can sometimes offer better deals seasonally and during sales. Fortunately, most all of these types of items are available with free shipping—which is great considering they can weigh over 250 pounds! To ensure you are getting a quality product, you should expect that a good infrared sauna has toxic-free materials, easily powered components, at least 4 EMF emitting heat sources, and the ability to be powered by regular household power outlets. 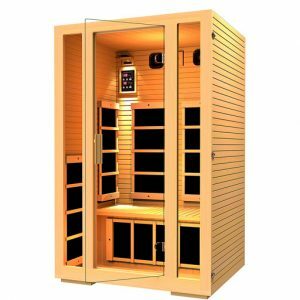 These saunas offer better materials, are more durable, have higher seating capacities, offer such amenities as back-supports and MP3 player hookups with speakers, have 6 or more heating elements, and offer digital control panels which allow very accurate temperature control. In addition to excellent temperature control, many of these types of home infrared saunas offer the ability to set user preferences, track patterns, and help make suggestions for extended usage. 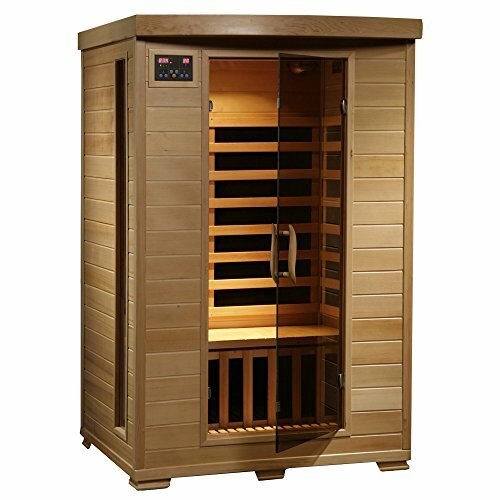 These saunas are typically priced anywhere from $1000 to $2500 dollars, and offer free shipping in most cases. They should all be able to be powered by a common household outlet and powered by a normal household circuit. The home infrared saunas in this category represent the cream of the crop and can range in price from $2500 and up. Every sauna in this category should feature an ample amount of heating elements and a lifetime warranty. These saunas featured furniture-grade wood finishing, offer materials from sustainability-harvested reserves, feature many other therapeutic benefits such as light therapy, have high-quality tempered glass doors, and may often require the use of a 20 amp circuit (pretty common, but double check) or two common household outlets. The takeaway, hopefully, from this article is that research has demonstrated that spending time in infrared saunas can benefit your health in many ways. From improved circulation to lowered blood pressure, the range of benefits is wide. Infrared Saunas are much more efficient in their ability to promote internal detoxification, are effective at much lower temperatures than traditional Scandinavian-style saunas, and are available for purchase on the consumer market! The handful of home infrared saunas listed here represents only a few of the great options available for those seeking to buy an infrared sauna for their home. These saunas come with all sorts of features, have an option in nearly every price range, and often come with free-shipping and lifetime warranties. The benefits are clear, the prices are accommodating, and the thought of having a sauna in at home to sit in during the colder months of the year is just about enough to make anyone want an infrared sauna of their own! Infrared Saunas are great modernized versions of traditional Scandinavian saunas that have been used for centuries. Through the use of near and far infrared energy, these products are able to help improve health in many different ways. While these products can be slightly expensive, there are plenty to choose from online, and most offer lifetime warranties and free shipping! Sears, Margaret E., et al. “Arsenic, Cadmium, Lead, and Mercury in Sweat: A Systematic Review.” Journal of Environmental and Public Health, Hindawi Publishing Corporation, 2012, www.ncbi.nlm.nih.gov/pmc/articles/PMC3312275/. Crinnion, W J. “Sauna as a Valuable Clinical Tool for Cardiovascular, Autoimmune, Toxicant- Induced and Other Chronic Health Problems.” Alternative Medicine Review : a Journal of Clinical Therapeutic., U.S. National Library of Medicine, Sept. 2011, www.ncbi.nlm.nih.gov/pubmed/21951023. Leppäluoto, J, et al. “Some Cardiovascular and Metabolic Effects of Repeated Sauna Bathing.” Acta Physiologica Scandinavica., U.S. National Library of Medicine, Sept. 1986, www.ncbi.nlm.nih.gov/pubmed/3766176. Wall, E.E. van der. “Sauna Bathing: a Warm Heart Proves Beneficial.” Netherlands Heart Journal, Bohn Stafleu Van Loghum, May 2015, www.ncbi.nlm.nih.gov/pmc/articles/PMC4409598/. Ernst, E, et al. “Regular Sauna Bathing and the Incidence of Common Colds.” Annals of Medicine., U.S. National Library of Medicine, 1990, www.ncbi.nlm.nih.gov/pubmed/2248758.